You are here: Home / General Information / Animals Today February 9, 2019: Ingrid Newkirk of PETA explains how and why fur as a product is losing popularity. Fur frequently mislabeled as faux fur. Learn to tell the difference. Celebrating whales. This show features PETA’s Ingrid Newkirk to speak about fur. Lori once again has the pleasure of speaking with one of the most important and visionary figures in the animal rights movement, and Ingrid begins by recalling the early days of PETA’s opposition to fur as a product. They go on to discuss the I’d Rather Go Naked campaign, the Los Angeles fur ban, how the fashion industry has largely turned away from fur, and many other milestones along the road to ending the use of fur. Ingrid states a tipping point was reached when Diane Von Furstenberg and Chanel agreed not only to reject fur but all exotic skins as well. After Ingrid signs off, Lori extends one of her points by providing detailed instructions and tips on how consumers can tell if the fur on a product, such as trim on a garment, is from an animal or is synthetic. This is a good skill to possess because many consumer products purporting to contain imitation fur still deceptively utilize real fur, which is often cheaper. The Maui Whale Festival occurs each February, so we conclude this show by speaking about whales and dolphins. The order cetacean contains around 90 species, broken down into toothed and baleen whales, and Lori explains the classification of these sea mammals. Plus, Lori springs a pop quiz on Peter – can you do better than him? Probably! 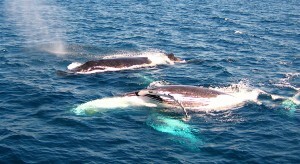 Humpbacks off the gold coast of Australia. Photo: Sea Shepherd Conservation Society. PETA’s work to end the use of fur has been ultimately successful.. The fashion industry has turned its back on cruel fur and now entire cities, including SF and LA, are taking a stand against it. There is no reason to kill animals for their hair, period. Thank you for this! Kind people wouldn’t be caught dead in fur, and for good reason. There’s no excuse for killing animals for their fur, especially when there are plentiful cruelty-free and eco-friendly ways to keep warm and stylish. Fashion can be fickle, but consumers, designers and trendsetting cities now agree on this point: Fur is dead. Thank you, PETA, for all your hard work! I only shop cruelty-free and it’s so refreshing to see so many fashion houses choosing compassionate synthetics. Fur should be banned everywhere! No one even needs fur—except animals. Humans can wear other warm and stylish cruelty-free options. Given all that is known about the profound suffering animals experience when raised and slaughtered for fur, why isn’t it illegal everywhere?